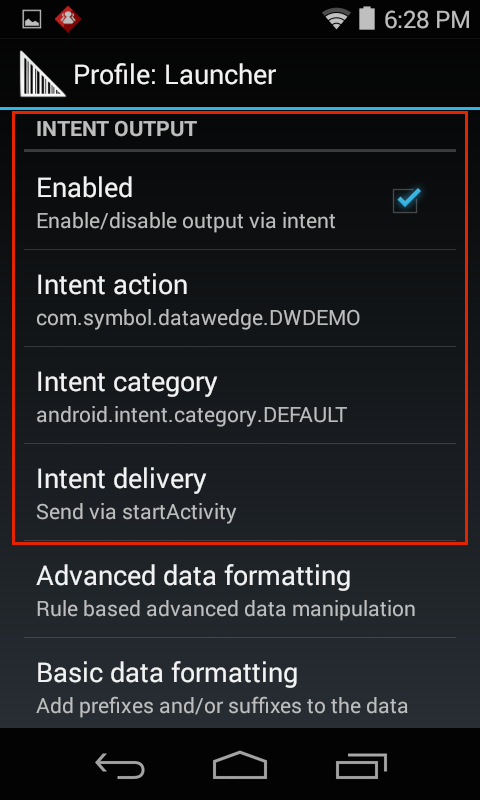 Intent Output allows data acquired and processed by DataWedge to be sent to the associated foreground application as payload within an Android intent object. This allows acquired data to be passed programmatically to an application, where it can be consumed or further processed. The core components of an application (its activities, services and broadcast receivers) also can be activated by intents, as can many DataWedge features through the DataWedge APIs. An intent object is a bundle of information that describes a desired action. It includes the data to be acted upon, the category of component that should perform the action and other pertinent data and/or instructions. When an intent is initiated, Android locates an appropriate component to respond to the intent, launches a new instance of the component (if needed), and passes the intent object to it. Components advertise their capabilities (the kinds of intents they can respond to) through intent filters. Since the system must learn which intents a component can handle before it launches the component, intent filters are specified in the app's AndroidManifest.xml file as <intent-filter> elements. A component can have any number of intent filters, each describing a different capability. Raw data is received as a byte stream using the com.symbol.datawedge.decode_data intent extra. See the Single Decode Mode section below. DataWedge invokes an intent though an Intent action in an Intent category as described in its AndroidManifest.xml file. When combined, these two values are like a "channel" to which an app can listen for intents that use the same combination, filtering out "noise" from other intents that use different value pairs. Once these values are known, DataWedge Intent Output must be set to match. Important: For scanning applications that output directly to an activity, the activity must be designated as "singleTop" in the app's AndroidManifest.xml file. Failure to designate an activity in this way will cause an instance of the activity to be launched with every decode, and the acquired data sent to each newly spawned instance. The parameters of this feature can be configured through the UI or by using the Set Config API. 1. Locate the Intent Output section of the Profile being configured. When Intent delivery is set to "Broadcast Intent", DataWedge sets the Receiver foreground flag Intent.FLAG_RECEIVER_FOREGROUND in the broadcast Intent, giving the broadcast recipient permission to run at foreground priority with a shorter timeout interval. Zebra recommends using this flag only if delays are seen in delivery of intents immediately following device boot-up. When Intent delivery is set to "Send via startForegroundService", startForegroundService() Android API is called to deliver data. This option applies to Android Oreo (v8.0) and above. When Intent delivery is set to "Send via startService", startService() Android API is called to deliver data for devices prior to Android Oreo (v8.0). For Android Oreo and above devices, the option "Use startForegroundService on failure" is available within this setting to call startForegroundService() if the startService() call fails. With this single option, it provides support for devices both prior and later than Android Oreo. Single mode reads and decodes a single barcode at a time, and is the most common decoding mode. For decoding multiple barcodes simultaneously, such as with UDI-compliant objects, see UDI/Multiple Decode Mode. NOTE: Source of incoming data is "scanner" for camera, imager or scanner. When decoding a UDI-compliant object, data is acquired from multiple barcodes simultaneously and output as a multi-decode bundle, which differs from a single-decode bundle. DataWedge also can acquire multiple non-UDI barcodes in a single scan. This section applies to both modes. Note: When multiple barcodes are acquired simultaneously, the decoded data is concatenated and sent out as a single string. Contents: Decoded data returned as a list of byte arrays. Note: In most cases there will be one byte array per decode.